Jumosol Extra Sweet Onions believes it is essential to work all together, from the most humble farmer to the most advanced agriculture, with every link in the chain to provide a better product to the Consumers, while taking care together of Mother Nature and the legacy to our children. Jumosol is a family-owned company that is professional in its management, innovative and different in its way of working and provides great service because of its focus on the Customer and Consumer. 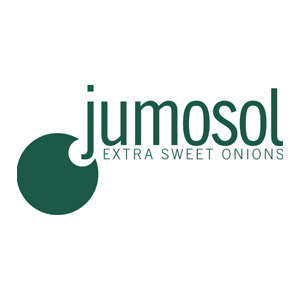 Jumosol grows sweets onions around the world to get our clients our “Jumosol Extra Sweet Onions” all year around. This onion breaks with everything we understand to be an onion, our onions eliminating rejection factors among many Consumers for consumption of regular onion. From the production of our own seed right through to the delivery to our Customers all over the world, our entire organisation focuses on guaranteeing the mild, crunchy and digestive flavour of the Jumosol Extra Sweet Onion. It is not very hot and there’s no lingering aftertaste. As a company driven by quality of our products, we launched and led the creation of the Fuentes de Ebro Onion PDO. GLOBALG.A.P. certification since 2001.